LA Unified Superintendent John Deasy told a packed courtroom today that it can cost the district “millions of dollars” and can take “slightly less than 10 years” to get rid of an ineffective teacher. Deasy was the first witness to testify in the long-awaited start of Vergara v California, a battle over state laws that govern what to do with ineffective teachers. Beatriz Vergara and eight other students from around the state want to get rid of the laws that make it difficult to dismiss the teachers. As defendants, the state and its largest teachers unions want to preserve them, arguing that school districts not state laws are responsible for the dismissal of ineffective teachers — and some districts manage quite well in carrying out the challenge. The day began with lawyers for both sides giving their opening salvos before Judge Rolf Treu in a state superior court in downtown Los Angeles. The thrust of the students’ case is that five state statutes make it difficult and expensive to remove ineffective teachers from the classroom. In the opening statement for the students, Ted Boutrous argued that every child has a constitutional right to a quality education — a right that has been violated due to the current teacher employment statues that he claimed handcuffs administrators in weeding ineffective teachers out of the classroom. Those statutes involve tenure, seniority and the dismissal process. Boutrous said the statutes also impose a disproportionate harm on poor and minority students, saying these students are more vulnerable to harm from ineffective teachers whom districts cannot dismiss. Anticipating defendants’ arguments, he said the case was not attempt to undermine teachers’ due process rights or an attempt to make teachers a scapegoat for problems like racism and poverty. Defense attorneys — Nimrod Ellis for the state and James Finberg for the California Federation of Teachers and the California Teachers Association — argued that the statutes aren’t the problem. Rather, they said, the key issue is poor management by school administrators. Ellis suggested that well managed schools are fully capable of getting rid of ineffective teachers. Additionally, the defendants contended that the students would be unable to show that the teachers they were assigned were grossly ineffective. Feinberg told the court that there are socio-economic factors outside a teacher’s control, which are responsible for the widening achievement gap. He insisted that declaring laws unconstitutional will not close that gap. The defense lawyers wrapped up their opening remarks by stating that they welcomed the challenge, but the real policy change must come from the legislature in Sacramento -– and that plaintiffs will not be able to prove that these statutes violate their constitutional rights. Deasy, under friendly questioning from a students’ lawyer, Marcellus McRae, walked the court through current state laws governing the hiring and firing of teachers, student performance markers, rules regarding tenure and the impact they have on the school district. A major focus was the so-called “tenure statute,” which in California enables teachers to gain permanent employment — or tenure — after just 18 months on the job. In his answers, Deasy explained that the process for evaluating a teacher for purposes of tenure actually begins after just 13 months of actual teaching, a period of time he dismissed as too short for such a critical decision. Deasy said the average cost of dismissing an ineffective teacher, which involves as many as 17 administrative steps, is $250,000 to $450,000, with many cases costing the district a lot more. He also testified that the current tenure statute doesn’t allow school administers to adequately assess a teacher’s performance or growth potential. He went on to say that he believes the tenure rules allow for “grossly ineffective teachers” to remain in the classroom. *Corrects surnames of lawyer –Elias, not Ellis; and Finberg, not Feinberg. Photo courtesy of Courtroom View Network. 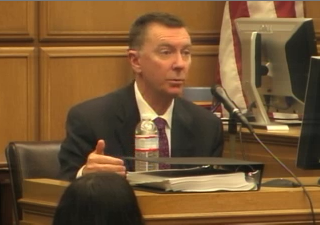 Previous Posts: Vergara trial set to begin: major test for CA teachers; A California court cleared the way for the ‘Vergara‘ trial to begin; John Deasy calls for stronger law to get rid of abusive teachers.